Innovative green upcycled corporate gifts are the way to go. Going green and giving green supports environmentalism and because these eco wine bags are made in South Africa purchasing them also supports sustainability in South Africa. These eco friendly wine bags are made from waste, used marketing billboards which are made from PVC. PVC takes 500 years to biodegrade so upcycled wine bags extend its life from landfill. What better way to give an innovative green upcycled corporate gift than with our billboard wine bags. 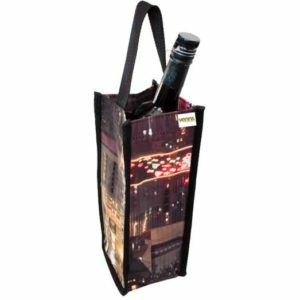 The wine bags have one short carry handle and are branded with a full colour PVC label which is sewn on in your preferred position. Made in South Africa from PVC Billboards. With one short carry handle.